No prior experience needed. Your best tool to start learning. 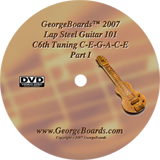 Lap Steel Guitar 101 is a 2 DVD/1 CD set geared toward steel lap enthusiasts who would like to learn the basics of playing with the C6th tuning, low to high strings C-E-G-A-C-E. The CD contains 6 tracks played by professional musicians. Track 6 provides accompaniment to Steel Guitar Rag. Let GeorgeBoards™ help you make the Transition to Lap Steel Playing. We teach you the tunings that the Pro's use and how to get a Clear, Precise Sound. 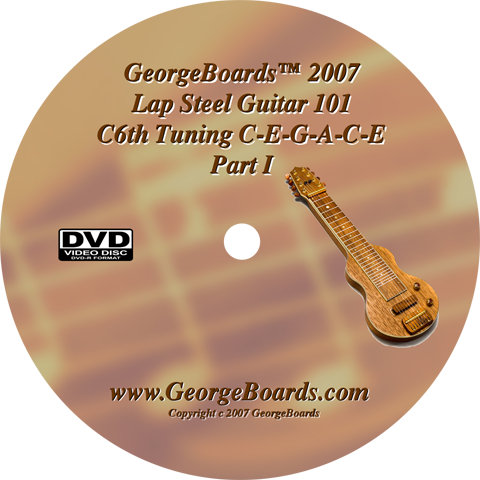 This 2007 release of Lap Steel Guitar 101 C6th Tuning DVD covers techniques you will need to know and practice, from how to wear your picks to creating Lap Steel specific sounds like Vibrato and Harmonic Chimes. GeorgeBoards™ method will have you playing Lap Steel Guitar in no time at all and having a lot of fun learning too! Quickly and Easily increase your playing proficiency with this Lap Steel Guitar 101 double DVD set. Effortlessly understand other GeorgeBoards™ DVDs as well as many more complicated courses available today. After you have completed this DVD set, try additional GeorgeBoards™ DVDs or other artist's videos and books. You will be amazed at how much easier everything is now and at how much more you can do in such a short time. Lap Steel Guitar 101, our most comprehensive instruction!! This Lap Steel Guitar 101 course is 2 Full hours - 2 Full DVDs. Super camera angles put you in the player's seat. Start with proper picking hand position. Learn how to pick and mute. Practice bar control along with the DVD movie for smooth sounding, accurately tuned licks. These DVDs are designed to play on your home television set on full screen with good audio and behave like rental movies. Use your remote control to select the movies of your choice. The pause, back up, and replay features of DVDs simplify the learning experience. Lap Steel Guitar 101is a favorite of Lap Steel Guitar players worldwide.